illus. by Lucy Knisley. 52p. Chronicle. Mar. 2019. Tr $17.99. ISBN 9781452161563. Baby-Toddler–Sweet illustrations using digital collage show babies with various skin and hair colors learning and growing. The text begins with a question: "Hello, You! You are new. When you're new… What can you do?" Seeing, tasting, hearing, being carried, taking naps, riding in a wagon, and experiencing an array of emotions are some of the activities pictured in large, clear illustrations. The rhyming text, which appears in bold black block print with some words highlighted in other colors has a fine meter but stumbles a bit with a couple of rhymes. 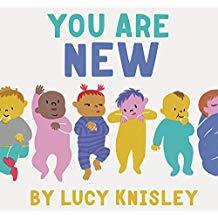 Girl babies, boy babies, brown babies, pink babies, yellow babies, tan babies with hair in blue, brown, purple, and teal demonstrate all there is to learn when one is new. VERDICT A perfect lapsit read-aloud or a good pick for older children who have recently welcomed a new sibling into their home.